Streetwear as a whole resonates so easily with the city of Los Angeles, so much that it’s a staple part of L.A. culture. 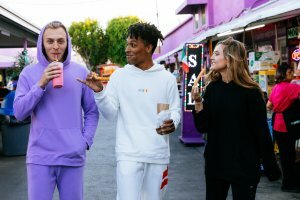 Streetwear loves L.A., and L.A. loves streetwear, so it’s no mystery as to why this city is a booming hub of creative brands and designers tapping into the category that has skyrocketed to mainstream fashion. 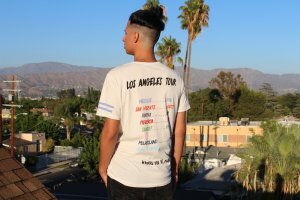 Los Angeles is saturated with streetwear brands, but few create with the position of a reaching out to a greater cause. 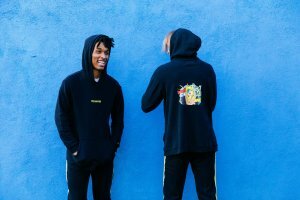 The young founders of WHERE thought about what it means to be a streetwear brand and really wanted to reflect a celebration of this amazing city through their clothing. They even took it further to expand the brand’s platform in a positive direction by partnering with the Time’s Up Organization and Legal Fund to combat sexual assault and inequality. 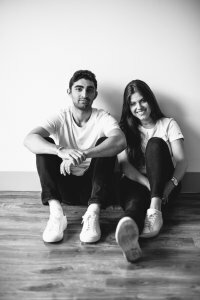 See what WHERE’s co-founders, Natasha Hunt Lee & Tyler Makhani, have to say about their brand and the overall message they want to deliver. 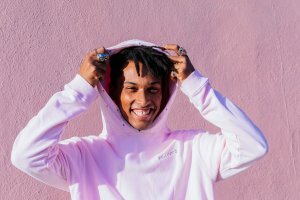 What separates WHERE Clothing from other streetwear brands? Something that we always notice with other streetwear brands is this nonchalant sense of coolness. You can see it in the model’s expressions and body language. Then, you add the intimidating nature of both influence and luxury and these brands are almost so ‘cool’ that they’re untouchable. We want to redefine that. We want to align “cool” with excitement and warmth and the sincerity that comes with those feelings. When we take photos, we make sure most of them are candid. We want everyone smiling. The Times Up movement is making some serious waves in today’s social climate. 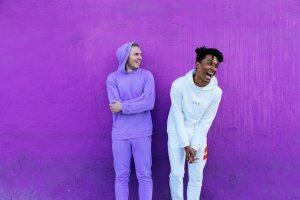 What compelled you to contribute to this initiative via your clothing brand? This is important to us for so many reasons. The work that the Time’s Up Organization and Legal Fund is doing to end sexual assault, harassment and inequality is imperative. Their platform is massive, and it’s so important to support their ability to fund legal representation for the victims of these crimes. Natasha: As a woman, specifically in the entertainment business, I am appalled by the way various powerful figures have taken advantage of their position by asserting themselves over so many, a majority being (but not limited to) women. In addition, there is a discrepancy in women’s pay, authority in the work place and our opportunities, benefits and representation. As a woman who has been given the privilege of an education, I think it’s only right to use my own, smaller platform to promote causes like Time’s Up. I am excited by and grateful for their work towards creating a safer and more honorable community. 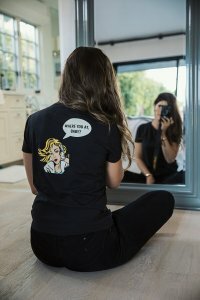 What message do you want WHERE Clothing to give its fans? Celebration. We want ours to transfer. We love what these clothes represent, and we want our customers to join us in celebrating when they buy something— whether it be Los Angeles artisanship, a special graphic, or the Time’s Up Legal Fund. What can we expect from the brand in future collections? This is just the beginning for us and we can’t wait to keep going. We will continue to perfect our fit and feel while bringing new ideas and inspirations to the table. We have so many designs ready and we’re so excited to share— from more creative capsules like REPOSE, to new city specific collections like our New York Series set to launch next year. Additionally, we are working on some collaborations and partnerships with other brands that uphold similar values and aesthetics. With every collection, we learn so much. It’s so fun for us to take that knowledge and invest it into our future.